To say that PHP is popular is an understatement. Its flexibility to gracefully handle tasks as varied as working with databases to executing a small function and returning some result have made it one of the most popular server-side languages used in web development. For many of you, that isn't a problem at all. You do not mind that PHP dynamically generates the HTML that your browser then displays to you. As sites like wordpress and others have shown, you can certainly use PHP to generate clean and valid HTML. There will be cases where an all-PHP solution isn't what you want. You may already have an HTML page, and all you want to do is simply use some data a PHP script returns. 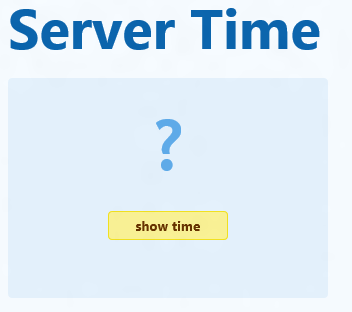 When you click on the show time button, a request is made to our PHP file, and the server's time is returned and displayed. In this tutorial, I will explain how to re-create this example and explain everything that goes on to make it all work. PHP page containing a script that returns the time. Make sure you have a server that is capable of running PHP scripts. Once you have that setup, let's get started with the next step - actually creating the PHP page. Don't worry about what these values are right now. I'll explain that shortly after you get everything working. With your PHP script ready, all that is left is for you to create the HTML page. 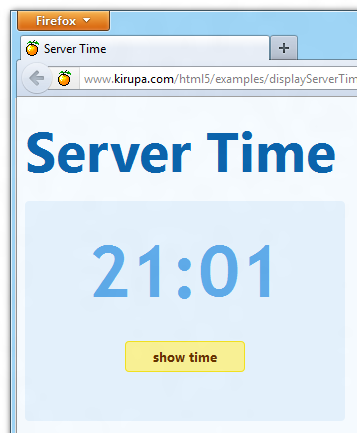 In the same directory your PHP file is in, create a new HTML file called displayServerTime.htm. If you are not getting it to work, make sure your document looks identical to what you have in my version of this example. Right now, you have a working example. You click a button and data from your PHP script gets magically loaded. In this section, let's examine why everything works so that you can reuse and extend the techniques shown here in your own examples. What gets loaded is the result of our PHP file executing whatever code was inside it. This means that what the PHP file sends is the result of it executing its code – the server’s time. All of the code that we have simply puts the high-level English description you saw into something the server and your browser can understand. In our first line, we declare a variable called request that we initialize to a new XMLHttpRequest object. The XMLHttpRequest object contains a lot of the properties and functions we need to asynchronously load data from a remote file. I create a variable called url that stores the path to file we want to load. 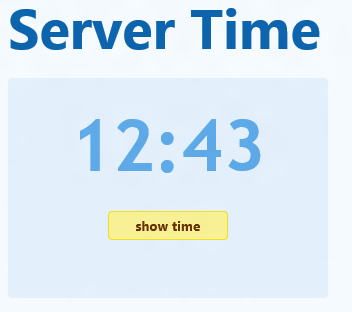 In our case, the file we want to load is our PHP file called servertime.php. The open function specifies the type of HTTP request to make and what other attributes to tag along as part of our request. In our example, the HTTP method we are using to open the connection is a GET, the URL we want to open is stored by our url variable, and the true specifies that we want this request to be an asynchronous call. In our case, we are primarily dealing with text/html data, so we specify that as part of our request. Earlier, I mentioned that we are requesting our data asynchronously. This means that you are not going to stop everything and wait for some data to be returned before we proceed with executing our code. Our code will continue to execute, and your application will remain responsive. This is great for your user experience, and it only very slightly complicates our code. 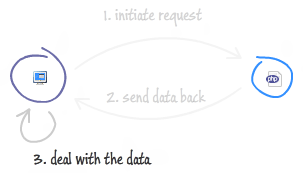 Because our data would instead be returned at some later point while your application is running, we need a mechanism for ensuring we react to our data when it does arrive. Our mechanism for handling this will rely on events. Notice that we are listening for this event in our request object. Once this event gets fired, we call the processData function to deal with the data we just received. We'll look at the processData function shortly. Everything we've done so far was building up to this moment where we send the request we've built. 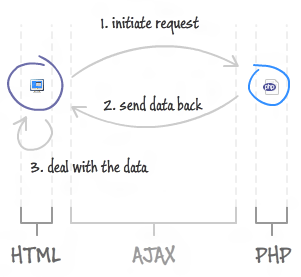 When this line gets called, your browser sends off a request to fetch data from our servertime.php file. Now that our request has been sent off, the next phase in our intergalactic voyage to display some data from a PHP file is to send our data back to our HTML page. To look at this a little deeper, all we are doing is returning (via the echo keyword) the JSON-encoded time as stored by our $localtime variable. To get the server's time, I use the localtime function to return an associative array of time values - the array which gets converted into a JSON format by the json_encode function. I won't be going into great detail on PHP in this tutorial, but you can learn more by checking out the great documentation on localtime, json_encode, and variables. Next up is our final stop in our journey, dealing with the data. So...you've fired off the request, gotten some data back, and now you want to take the data and do something with it. Let's look at the code for handling this phase of the journey. Think of the processData function is an intermediary. All it does is takes the data that was returned, performs some minor validation, and passes it off to another function to properly deal with it. When a request has succeeded, your readyState property is set to 4, and the status property is set to 200. A readyState value of 4 indicates that all of the data has been received, and a status of 200 corresponds to the HTTP status code whose description is OK. We access both the readyState and status properties by polling our event argument's target property (e.target) and assign the values to the currentReadyState and currentStatus variables. The data returned from our request is stored in the responseText property which also lives inside e.target. The responseText property stores the JSON array data that you saw in your PHP file earlier. Just to emphasize that sentence again, "The responseText property stores the JSON array data that you saw in your PHP file earlier." This is awesome. This function is responsible for displaying the data from the server in our HTML page. The data returned by the server (e.target.responseText) is passed in to this function and now referenced by the response variable. You can easily convert a string into a JSON object by using the JSON.parse function, so that's what we used here. Our JSON object is a series of object/property pairs, and the name of the properties was originally defined by the localtime PHP function. All I am doing in our code is mapping between the weird localtime property names (tm_hour and tm_min) to something we can better understand - hour and minute. Because you see only one digit when your minute value is less than 10, I check for when that happens and prepend a "0" character in front of our value. And with that, we've come full circle to examining how to display data from a PHP file. 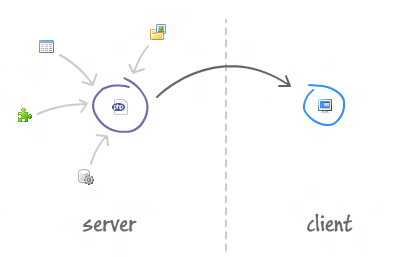 Communicating data between a client and server is something that is more complicated than it seems. There are many ways to do all of this, and in this tutorial I showed one, very simple way. Hope you all liked this, and feel free to post on the forums if you have any questions!